Ludwig Göransson's original score to Black Panther was notable for being different and for the lengths that Göransson went to in order to create a truly interesting listening experience. The release of this EP hands over some of the original tracks to DJs and producers to put a new spin on an already unique sound. Göransson produced and remixed two of the five tracks, 'Waterfalls' and 'Black Panther.' This release also includes tracks produced by DJ Dahi (Kendrick Lamar, Kanye West, Drake), Canadian producer WondaGurl (Travis Scott, Big Sean), plus Michael Uzowuru and Jeff Kleinman (Jorja Smith, Anderson Paak, Frank Ocean). 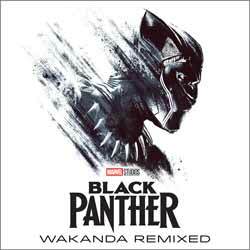 It goes without saying that if you didn't enjoy the original album then you'll probably not get much out of this... but for fans of Black Panther, the Wakanda Remixed EP provides a new take on some firm favourites. 3. "Ancestral Plane (Uzowuru and Kleinman Remix)"